Only a few short weeks ago Chevrolet wowed the international automotive fraternity with its awe-inspiring Corvette ZR1, a track-honed, 563kW (755hp in the old money), 969Nm beast of a supercar. It’s a truly awesome looking machine and will almost certainly be one of the quickest cars in the world around a race track. 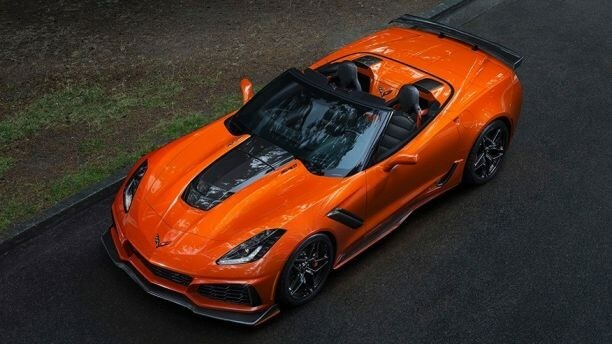 The ZR1 does have one fatal floor though… it’s got a roof, which will surely alienate all those prospective customers out there who want all the thrills the ZR1 has to offer, but also want to get a tan on. Chevrolet has obviously come to the same conclusion though, because they’ve just unveiled the ZR1 convertible, and it looks bloody marvellous. For a start, it’s still got the same LT5 6.2lt supercharged V8 with the same power figures as its fixed-top brethren. And, unlike most supercars that lose a roof, because of the chassis’ trick aluminium construction, Chevrolet reckons that the convertible ZR1 isn’t compromised with extra weight or chassis flex. In fact, Chevrolet says that the extra 27kg weight penalty the convertible incurs is almost entirely down to the folding roof mechanism. Whatever the case, it’s certainly no slouch, as the convertible ZR1 will rocket towards a monumental top speed of 341km/h, which is just absurd. It’s a mega-looking car, and it’s going to cost the Yanks a mere $123,995 US Dollars, which is a crazy amount of performance for the money. As with most awesome American performance cars however, with the exception of the Ford Mustang, we’re not getting it Down Under, which is a massive shame.